If you are another PDR company and like the idea of our PDR Price Guide Video, then there’s no need to try to create something like it for more money and time. You can order your video and have it customized to your liking. Below is a couple videos we did for SOS Dent and Johnny Dents. 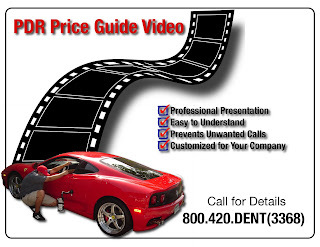 Our video was created to educate the public about cost, difficulty types of dents and cut down on price questions over the phone. We even took some steps further and created an animation for a customer to take photos a correct way and email them. This also helps give an accurate quote without asking them to send addtional photos. You can use for your website, Youtube or even pass out as a DVD promo. We wanted to create a short and simple video presentation that gave a professional impression. The more your customers understand your product, the more they feel comfortable using your service. You can purchase this video online through AutoLecture.com or call us direct for more info at 858.699.054.